Our previous blogs in this series have gone over signs that are commonly seen at businesses such as building signs, lobby signs, or even vehicle signs. But depending on your industry, there are times when you need to advertise outside of your business location. This is where event signage comes in. 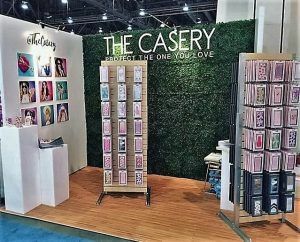 If you are at a trade show among a sea of other businesses, you need to make sure that your booth is going to stand out. No matter the product, consumers will always gravitate toward a visually appealing booth. Whether you have a small banner hanging from a picnic table or full wall size prints on all four walls of your booth, the most important information to display is your company logo. No matter how impressive your display is, it won’t do anything for your company if the person visiting your booth has no idea which company’s products they’re looking at. Repeating your logo throughout the display is also a great idea. Whether it is on existing merchandise, or having many business cards at your disposal. 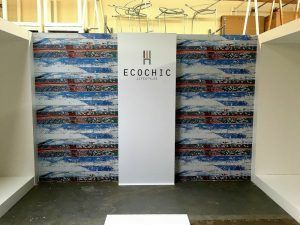 We can also make signs that you can incorporate into your booth design that can be removed and re-used for future use. This way you can make sure to display your logo at any event. We can do this by applying the sign onto some sort of backer. Whether it is a digital print, dimensional letters, or even an illuminated sign, we can attach the components of the sign onto a backer of your choosing that can be attached, removed, and moved around for different purposes. Another instance where you will want to display customized signage is when you are promoting a new product. We had a customer in the past that took over a frozen yogurt shop for a day to promote their mobile game. 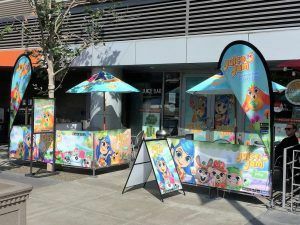 Not only did we cover surfaces on the inside with characters from the game, the outside window, gate, and umbrellas were all matching along with flag signs and A-frame signs. The bright colors of the characters and the game definitely drew in some foot traffic, and it wasn’t easy to miss the name of the game they were advertising. To top it off, we made outdoor floor graphics with fruits on them that were cut in the shape of arrows pointing to the event so people walking around downtown could follow these arrows to the frozen yogurt shop. No matter what the event is, we can help you get creative with your advertising and design signage that will help your brand get recognized.